In the case of 32 High Street, we know that the owner of the building fronting the High Street also owned the buildings, yard and garden to the rear. This arrangement changed in modern times when James Liddiard developed the buildings in the rear to create a house and workshops for his antique business and sold off the shop building on the High Street as a separate entity. Andrew Whitfield (in some documents he is called Whitefield) – Andrew was a glazier. We don’t know when, but we know that Andrew bought the property from Benjamin Parnell and that Andrew lived there up until the time of his death in 1777. Andrew was baptised in Thornbury on 27th February 1715. His father was Robert Whitfield. On 31st January 1738 Andrew married Mary Dimery. The Ancestry website says she was the daughter of Richard Dimery of Hill and Jane Cox and Mary was born in Cromhall in 1718 and baptised 14th December 1718. They had several children: Martha who was born about 1741 and died on 31st May 1756, Mary born on 15th May 1743, Sarah baptised on 6th April 1746 who died aged 13 and was buried on 13th September 1759, George born on 17th July 1748, Catherine born on 2nd March 1751, James born on 24th August 1753 and Andrew born on 9th November 1754 who died on 29th September 1759 aged 5. Andrew’s wife, Mary, was buried on 19th March 1760. The accounts book of the Duke of Norfolk show that Andrew Whitfield was paid £4 12s 1½d for glazing work done in Thornbury in 1775 and £2 2s 8½d for gazing in 1776. Andrew died aged 62 and was buried on 20th July 1777. His burial record notes that he was still Clerk of the Parish when he died. The parish burial records also show that Andrew’s son, George, died within a few months of his father and was buried on 26th October 1777 aged 29. It was noted that at the time of his death George was the Clerk of the Parish and son of the late Clerk. ‘All that messuage or tenement and dwelling house wherein Andrew Whitefield glazier deceased (the then late father of the said Mary Whitefield) for many years before and at his decease inhabited and Richard Cossham carpenter did then dwell consisting of a parlour shop kitchen cellar and the whole and sole use and enjoyment of the entry or passage through the same with actual several rooms and Garrett upstairs lying above and over the said last mentioned rooms between the stone and party walls on the north and south sides of the said messuage or tenement and dwelling house and also with the free use of the yard backside and brewhouse thereunto belonging in common with the owners occupiers and tenants of a certain other messuage or tenement theretofore in the occupation of Arnold Smith Cooper but then belonging to and in the occupation of Richard Wither shopkeeper. And also all that garden or garden ground adjoining near and belonging to the said messuage or tenement dwelling house and which contains a moiety or half part then afterwards divided by admeasurement of all garden or garden ground (being the northward part of) which were theretofore divided into 3 plots or parcels then in several occupations of said Andrew Whitefield Andrew Smith and Joseph Latch nailor. All which said messuage or tenement and dwelling house rooms garden ground hereditaments and premises above mentioned and described or were thereby or intended to be thereby granted and released were situate and being in the borough of Thornbury and were then in the tenure or occupation of said Richard Cossham as tenant thereof of said Mary Whitefield and were theretofore bought and purchased by said Andrew Whitefield in fee simple of and from Benjamin Parnell maltster then deceased and afterwards by said Andrew Whitefield in and by his last will and testament in writing bearing date on or about 28th April 1777 executed and attested as by law required for the disposition of real estates by will gave and devised the same unto his daughter Mary Whitefield her heirs for ever as may appear‘. In 1789 Richard inherited from his father, ‘a messuage wherein Robert Facey doth now dwell with garden and orchard in the High Street which I purchased (with other premises hereinafter devised to my son Jesse) of James Tyler’. We think this property became the house often referred to as ‘Miss Saise’s cottage located between 67 and 69 High Street. Richard was also left a third equal share in his father’s ‘timber board and quarter which is saleable or such and fit to cut and work’ and an annuity of £10 to be paid by Richard’s brother, Jesse. Ann Davis – on 16th and 17th February 1790 Ann bought the property for £80. Ann was daughter of George Cossham and his wife, Elizabeth (nee Witchell) and the brother of Richard Cossham who had been living at the house previously. Ann was baptised 25th January 1745 and on 15th May 1771 she married James Davis. James died aged 34 and was buried on 4th April 1775 whilst living at Morton. When her father died in 1789 he left Ann ‘a messuage and shop now in her occupation in High Street adjoining on the north side to a messuage late in the occupation of John Longman perukemaker and now of Isaac Pullin currier‘. This property was the one which became known as 33 High Street. Ann died aged 53 and was buried on 10th February 1797. In her will she left the property at 32 High Street to her niece Ann Cossham, daughter of her youngest brother, Jesse Cossham. It is interesting to note that Ann was only aged about six at the time. The will specified that if Ann died before she was 21, the property would go to her brother, George, and if he died before he was 21 then it would go to Jesse, their father. In the event, Jesse Cossham died in 1797 so the property descended to her niece, Ann. Ann Cossham – inherited 32 High Street from her aunt, Ann Davis in 1797. At the time that the will was written in 1796, the occupant of the property was Mrs Cooper. The 1800 Land Tax record shows that the property was owned by Ann Cossham and let to John Greenwood. We can’t be sure but we suspect that John Greenwood was born on 31 October 1771 the seventh child of William Greenwood, a baker and his wife, Mary. John was a cordwainer and he married Sarah Lewis on 16th November 1797. Thomas Smith – the abstract show that Thomas Smith, a tailor, bought the property on 29th and 30th April 1819 for £370. The Rent Roll shows Thomas had been living here from at least 1809 as a tenant to Ann Cossham. The 1819 indentures describe the property as ‘All that messuage or dwelling house then in two tenements or dwelling houses with the garden and appurts thereto adjoining and belonging situate on the west side of the High Street otherwise Fore Street of the town and borough of Thornbury then formerly in the occupation of Mrs Cooper afterwards of John Greenwood and then of said Smith‘. The abstract shows that Thomas had borrowed £200 from John Tompkins of Brislington gentleman, but although he had paid the interest of the loan, he had failed to repay the capital sum. Thomas arranged another loan of £250 with Samuel Leonard of Hill, yeoman to enable him to repay the debt to John Tompkins and ‘to supply his other occasions’. We are not sure when Thomas died, but his son, Samuel took over the property at 32 High Street. Samuel Court Smith – we know from the 1840 Tithe Survey that Samuel Smith was living at 34 High Street, but we know from a newspaper report dated 30th October 1841 that Samuel was then occupying a shop and dwelling house owned by Thomas Smith which was being sold at auction. This property was at 32 High Street and we are therefore unsure whether Samuel was living at 32 or 34 High Street at the time of the 1841 census. In this census Samuel was described as a tailor aged 38 living with his wife, Ann, and their children: Henry aged 15, Thomas aged 13, Mary aged 8, Samuel aged 5 and Elizabeth aged 3. Samuel was born on 25th October 1802, the son of Thomas Smith and his wife, Sarah. Samuel was baptised on 15th April 1804. On 10th September 1825 Samuel married Ann Gayner in Bristol. Ann was baptised on 28th November 1802, the daughter of Charles and Ann Gayner. Samuel and Ann had several children: Henry baptised on 2nd December 1825, Thomas baptised on 28th October 1827, Ann baptised on 28th April 1830, Mary baptised on 22nd January 1832, Samuel Court Smith baptised on 12th April 1835 and Elizabeth Smith baptised on 10th September 1837. Ann died in 1844. The 1851 census shows Samuel still living at 32 High Street. He was described as a master tailor employing 6 men and living with his children: Henry an artist aged 25, Ann a dressmaker aged 21, Mary aged 19 ‘At Home’, Samuel an apprentice tailor aged 16 and Elizabeth a scholar aged 15. Also living with Samuel were a nephew, Charles Smith aged 12 who was born in Olveston and was working as an apprentice tailor and Samuel’s mother-in-law, Ann Gayner described as a housekeeper aged 79. Following his father’s bankruptcy in 1841 it appears that 32 High Street failed to find an interested buyer when it was put up for auction and the property passed to Samuel. Samuel also inherited his father’s debt to Samuel Leonard. By 1852 when Samuel Leonard wrote his will in 1852 the debt amounted to £250 plus interest. Following his death in 1856 his trustees, James William Cox and Thomas Leonard were charged with recovering the debt from Samuel Smith. It appears that Samuel was unable to repay the debt and the property was taken over by James William Cox. He was shown as the vendor when on 26th September 1857 the property was put up for sale at auction. It was described as ‘Freehold business premises – a substantially built messuage comprising a good front shop with workhouse over, parlour, kitchen, underground cellar, three bedrooms, and two attics together with detached back kitchen, stable and productive walled garden. The premises are well situated in the centre of the High Street of the town of Thornbury, having a frontage of about 36 feet and in which a business of Tailor, Draper and Hosier etc has been carried on for upwards of 50 years past and are in the occupation of Mr. Samuel Smith‘. On 26th September 1857 Samuel sold the property for £220 to George Walker. The 1859 Rate Book shows Samuel had moved further down to 16 High Street, but by the 1861 census he had moved again to one of the two shops which now make up 14 High Street, the Wildings store. Samuel was living in the building nearer to Park House and the Lion. The 1861 census shows him living there described as a tailor aged 58 with just a servant Ann Parnell aged 45 to keep him company. On 13th June 1862 records of the Thornbury Union reported that a nuisance existed on premises in Front Street occupied by Samuel Smith, tailor, caused by a foul and offensive privy. The authorities decided to communicate with the owner and occupier to procure an abatement. The 1871 census shows them still living there and he appeared to remain here until his death in 1876. He died aged 73 and was buried on 15th September 1876. George Walker – we have a copy of the sale conditions referring to an auction of the property in 1857 and this shows it was bought by George Walker, a butcher, for £220. The 1861 census shows that there were two George Walkers living in the property, both of them butchers! We suspect that it was George snr who bought the property because ended up staying here after his son moved away. John Taylor – the 1881 census shows the property was occupied by John Taylor, a butcher employing one man and a boy. John was living with his wife, Annie, and their children: Annie baptised on 6th December 1878 and John Godfrey baptised on 28th April 1880. The Rate Books from 1880 to 1887 show John as the occupant of the property. 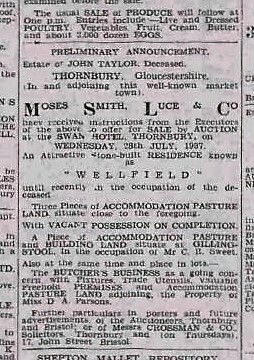 John Taylor’s property in Thornbry and the surrounding area became quite substantial as is evidenced by the advertisement for sale of his estate at his death in 1937. John was born in Bitton about 1853. He was the son of Joseph Taylor, a butcher and his wife, Eliza. The 1871 census shows John was assisting in his father’s business. In 1877 John married Annie Godfrey in the Bristol area. She was born in Bitton in 1857. John and Ann had three more children: Eliza Sarah baptised on 5th November 1882 (who was referred to as ‘Ella’ in the 1891 census, Alfred Joseph baptised on 9th February 1886 and Harold Francis born on 26th April 1892 and baptised on 18th May 1892. The 1891 census shows that John and the family had moved to 26 High Street. They now had an unmarried aunt, Mary Godfrey living with them aged 74 born in Kingswood. The 1905 Rate Book shows that John had bought the property at 26 High Street. In October 1916 John applied for military exemption on behalf of an employee (William Hirons Salisbury) on the basis that he could not manage without him. John reported that he killed 3 bullocks, 20 sheep, 3 or 4 pigs each week as well as keeping 5 horses. In 1917 John also bought The Crispin House at 2 Crispin Lane. We are not sure where John and the family lived at this time. The deeds of Crispin House show that ‘Frank Taylor’, presumably John’s son, Harold Francis, a butcher, had been the occupant of the house prior to its sale. The 1921 electoral register shows John and Annie still in the High Street and Harold Francis living in Crispin Lane (then called Blakes Avenue). In April 1921 John put the property at 26 High Street and his business up for sale. The report in the Chronicle shows he had been in business for 44 years and had bought the premises 32 years previously. By 1925 John had let Allen Horder, another butcher, take over the business at 26 High Street, although he still owned the building. Crispin House was also owned by John, but that was vacant. By 1926 he had sold Crispin House to Ethel Higgins. The 1927 electoral register shows John and Annie living at Wellfield on Kington Lane. Elizabeth Sarah married Harold Ann, a builder and the son of Stephen Ann, builder and decorator deceased on 17th February 1909. Harold Francis – became a butcher. He was admitted (under the name of Francis) to the National School in 1896 but left late that year to go to private school. He married Clara Harriett Chorley in the Bristol area in 1919. Clara was born on 13th August 1891. Their daughter, Muriel Jean, was born on 25th March 1924 and baptised in Thornbury on 20th April 1924 when they were living at Crispin House. The 1926 Rate Book shows Harold in Blakes Avenue. We assume that he is the ‘Frank’ Taylor referred to in the deeds as occupying The Crispin House prior to its sale in 1926 in which case he is likely to be the young man known to be ‘Frank Taylor’ a butcher shown in the photo on the right. The special register compiled in 1939 in preparation for the war Harold and Clara were living in Church Road. It notes that Harold had been working as a butcher in the merchant navy but he was discharged in 1939. Harold’s son, Norman Francis was killed in the Second World War. He was serving as an assistant storekeeper on HMS Manistee when he died on 24th February 1941. The Manistee was escorting a convoy when it was hit by a German torpedo south of Iceland. The Thornburian Magazine says that he had called in to the football field to say goodbye to his former fellow pupils and staff before joining his ship. The magazine points out that he had served barely three months before being killed at the age of 20. Annie Taylor died on 18th November 1933 aged 76. An inquest was held into her death at Wellfield. She had gone upstairs to change her dress when her daughter heard a thud and found her mother unconscious lying at the bottom of the stairs with a basket beside her. John died on 14th May 1937 aged 85. His address at the time of his address was Wellfield.